What is choline? This article explores various types of choline available today. Choline supplements are recommended for improving memory and cognition. Supplementing with choline may also have the potential to improve a variety of other health factors. Choline supplements are especially relevant to vegetarians and vegans, who are at risk of not consuming sufficient dietary choline. Choline supplements have also been recommended by various researchers and medical professionals and are effective for most people. We explore the potential risks linked to diets that are overly rich in choline. These risks are also associated with a high consumption of animal products. Why should you take Choline? Improving inflammatory markers: A large study on over 3000 men and women was published in the American Journal of Clinical Nutrition in 2008. The study looked at the average choline intake in people’s diets and compared it to the prevalence of inflammation. There was a statistically significant correlation between choline and a reduced level of inflammation. Alternative forms of choline may have different and more pronounced benefits, which we discuss below. What are the different forms of Choline? Today, there are four major forms of choline that people take as dietary supplements. There are a few other minor forms too, but we will focus only on the four most relevant forms available today. These include lecithin, CDP-Choline, Alpha GPC, and Choline Bitartrate. While lecithin is an important source of dietary choline, it is definitely not the best source of choline for beneficial health effects. Soy lecithin, the most common source of lecithin, is a highly processed food substance. Alpha-GPC is another choline-containing phospholipid and is very similar to CDP-Choline. Alpha-GPC is a bioactive compound that is formed during lecithin metabolism. Alpha-GPC increases your choline levels and acts as a precursor molecule to phosphatidylcholine and acetylcholine. Although these potential benefits are interesting and thought-provoking, the body of evidence for Alpha-GPC’s efficacy in healthy people is still lacking. More studies need to be conducted on this compound to further elucidate its potential health benefits – especially in improving cognition, memory, and athletic power. Choline Bitartrate is a salt form of choline. It is the simplest version of choline available as a dietary supplement and provides and effective source of choline supplementation. There have been many studies on the effects of choline supplementation. 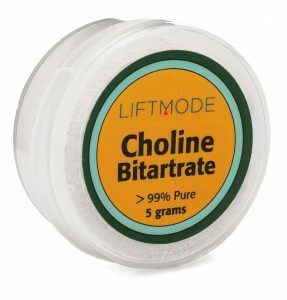 Some view Choline Bitartrate as an effective Nootropic substance. Others recommend that Choline Bitartrate is seen as a dietary supplement to improve choline levels and improve health as a result. Furthermore, dietary sources of choline are usually extremely high in cholesterol. Eggs, for example, contain around 212mg of cholesterol and 125mg of choline, per egg. This is why it is recommended to take a Choline Bitartrate supplement instead. Diets that are high in animal products and processed foods can lead to obesity, diabetes, and other diseases. However, we’d encourage you to not exceed the recommended dosage for Choline Bitartrate, and we also recommend speaking to your physician if you are currently consuming a diet that is high in animal products and processed foods. Conclusion: What is choline and why take it? So then, what is choline? In conclusion, there are four main types of choline that people take: lecithin (either as a supplement or in food), CDP-Choline, Alpha GPC, and Choline Bitartrate. Each has it’s pros and cons. Lecithin is primarily used as a food additive but is also a good source of dietary choline. CDP-Choline and Alpha GPC have strong evidence suggesting Nootropics uses – improved memory and cognition. Choline Bitartrate is a good supplement to improve choline levels and promote good health. Choline is an essential nutrient with vital functions in your body. Studies suggest that the majority of people do not consume adequate choline in their diets. Choline is especially important during pregnancy, breastfeeding, and infancy, and may also have an important role in reducing cognitive decline in aging. There may be health risks associated with diets that are overly high in choline – ie, diets that are rich in animal products like meat, eggs, fish, and dairy. No studies have been done to assess the long-term effects of high-dosages of choline supplements. Do not exceed the recommend dosage for any choline supplement. LM. Sanders, SH. Zeisel, “Choline: Dietary Requirements and Role in Brain Development”, Nutr Today. 2007; 42(4): 181–186. “Dietary Reference Intakes for Thiamin, Riboflavin, Niacin, Vitamin B6, Folate, Vitamin B12, Pantothenic Acid, Biotin, and Choline”, Institute of Medicine (US) Standing Committee on the Scientific Evaluation of Dietary Reference Intakes and its Panel on Folate, Other B Vitamins, and Choline, Washington (DC): National Academies Press (US); 1998. IY Ozarda, G Uncu, IH Ulus, “Free and phospholipid-bound choline concentrations in serum during pregnancy, after delivery and in newborns”, Arch Physiol Biochem. 2002 Dec;110(5):393-9. SH Zeisel, MD Niculescu, “Perinatal choline influences brain structure and function”, Nutr Rev. 2006 Apr;64(4):197-203. AM Molloy et al., “Choline and homocysteine interrelations in umbilical cord and maternal plasma at delivery”, Am J Clin Nutr. 2005 Oct;82(4):836-42. P Ganguly, SF Alam “Role of homocysteine in the development of cardiovascular disease”, Nutr J. 2015; 14: 6, Published online 2015 Jan 10. P Detopoulou et al., “Dietary choline and betaine intakes in relation to concentrations of inflammatory markers in healthy adults: the ATTICA study”, Am J Clin Nutr. 2008 Feb;87(2):424-30. KA da Costa et al., “Choline deficiency increases lymphocyte apoptosis and DNA damage in humans”, Am J Clin Nutr. 2006 Jul;84(1):88-94. X Xu et al., “Choline metabolism and risk of breast cancer in a population-based study”, FASEB J. 2008 Jun; 22(6): 2045–2052. CR SCHOLFIELD, “Composition of Soybean Lecithin”, Journal of the American Oil Chemists' Society, vol. 58, no. 10 (October 1981), p. 889-892. SS Anand et al., “Food Consumption and its impact on Cardiovascular Disease: Importance of Solutions focused on the globalized food system”, J Am Coll Cardiol. 2015 Oct 6; 66(14): 1590–1614. XA Alvarez et al., “Citicoline improves memory performance in elderly subjects”, Methods Find Exp Clin Pharmacol. 1997 Apr;19(3):201-10. WD Killgore et al., “Citicoline affects appetite and cortico-limbic responses to images of high-calorie foods”, Int J Eat Disord. 2010 Jan;43(1):6-13. M De Jesus Moreno Moreno, “Cognitive improvement in mild to moderate Alzheimer's dementia after treatment with the acetylcholine precursor choline alfoscerate: a multicenter, double-blind, randomized, placebo-controlled trial”, Clin Ther. 2003 Jan;25(1):178-93. EL Richman et al., “Choline intake and risk of lethal prostate cancer: incidence and survival”, Am J Clin Nutr. 2012 Oct; 96(4): 855–863. ST Zeng et al., “Egg consumption is associated with increased risk of ovarian cancer: Evidence from a meta-analysis of observational studies”, Clin Nutr. 2015 Aug;34(4):635-41. “A Milk Protein, Casein, as a Proliferation Promoting Factor in Prostate Cancer Cells”, SW Park et al., World J Mens Health. 2014 Aug; 32(2): 76–82.